Tomato purée is never referred as "passata di pomodoro", when it has been sieved to remove seeds and lumps. 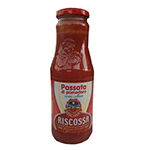 Passata's main difference is that it is not cooked. In this form, it is generally sold in bottles or aseptic packaging, and is most common in Europe. Ideal for catering establishments. Including hotel, lodge or restaurant business. Product of Italy.